Heel spurs can be the cause of significant heel pain. Believe it or not, you probably have bone spurs without knowing it, because most bone spurs themselves cause no symptoms. But if a spur on your heel bone happens to rub on soft tissue like the plantar fascia, causing plantar fasciitis, or worse yet on a nerve, the tissue breaks down, causing swelling, pain, and tearing. Bone spurs in the foot can also cause corns and calluses as tissue builds up around the spur. When your heel bone is exposed to repeated activities that put stress on your feet, downward pressure from being overweight, or stress from wearing poorly fitting shoes, calcium deposits form on the bottom of the bone. 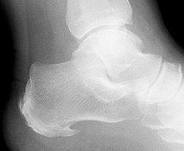 These deposits build on each other, eventually causing a spur-shaped deformity called a calcaneal spur (calcaneal is the medical term for your heel bone). Those who are obese or have flat feet, and women who frequently wear high heels are most susceptible to heel spurs. Although many people with plantar fasciitis have heel spurs, spurs themselves are not the cause of plantar fasciitis pain. In fact, one out of 10 people have heel spurs, but only 5 percent of these have foot pain. Because the spur is not the cause of plantar fasciitis, the pain can be treated without surgically removing the spur. Heel spurs do not require treatment unless they are causing pain or damaging other tissues. When indicated, treatment may be directed at the causes, the symptoms, or the spurs themselves. More than 90% of patients with plantar fasciitis caused by a heel spur will improve within 10 months of starting simple, non-surgical treatments. Better shoes and orthotics: Shoes with thick soles and extra cushioning can reduce pain. Pre-made or custom orthotics (shoe inserts) are helpful as well as soft silicone heel pads to elevate and cushion your heel. Extracorporeal shockwave therapy (ESWT): High-energy shockwaves stimulate the healing process in damaged plantar fascia tissue. ESWT is noninvasive—it does not require a surgical incision. If the bone spur continues to cause pain, we may suggest a steroid injection at the painful area to reduce pain and inflammation of the soft tissues next to the bone spur. If pain continues, surgical intervention may be recommended. Remember, no pain is normal. If you have persistent heel pain, your body is telling you that something’s wrong. PA Foot and Ankle Associates in Allentown stands on the cutting edge of successful, reliable medical technology and sports medicine. We’re proud to announce that we now offer the FAST Technique for patients suffering heel pain and arch pain associated with chronic tendinitis or tendinosis. In the past, if you had chronic pain in your Achilles tendon (at your heel) or plantar fascia (arch of your foot), treatment options would include ice, rest, elevation and over the counter pain meds. If that failed to work, your podiatrist may have used a shot of the steroid hydrocortisone to relieve your pain and physical therapy. If the pain returned, open surgery to remove the damaged tendon may have been recommended. There’s now an alternative to the open surgery option: The FAST Technique, a minimally invasive alternative to open foot surgery for these conditions. FAST is an out patient procedure performed with only local pain medicine, no anesthesia, and you return home that same day. FAST uses ultrasound imaging, similar to the ultrasound used to visualize babies in the womb, to guide the physician during the procedure. Once the damaged tendon is identified, the podiatric surgeon delivers high frequency energy through a needle only the size of a toothpick, which breaks down the damaged tissue and removes it. The entire procedure takes less than 15 minutes. This is a really exciting new procedure, because 95% of patients experience pain relief within one week. Visit the FAST Technique page on the PA Foot and Ankle Associates website to learn more about eliminating heel pain and arch pain caused by chronic tendinitis or tendinosis. 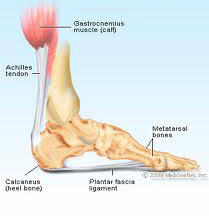 Do you think East Penn Foot and Ankle Associates could have prevented Ryan Howard from rupturing his Achillles Tendon? 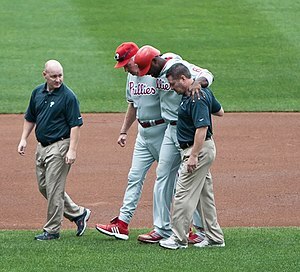 Ryan Howard of the Phillies had been having problems with his ankle for weeks preceding his season ending injury. He had been trying to continue to play, but his ankle pain was making it difficult for him to remain on the field. Without time to rest before the playoffs, Howard opted for an injection of cortisone in the area of the Achilles tendon. The injection was given 2 weeks before his tendon ruptured. Injecting a steroid such as cortisone around the Achilles tendon is very controversial. Injections into the tendon or around the tendon are known to increase the likelihood of tendon rupture. Usually, if an injection is considered, a lengthy period of rest and avoid major physical activity for a period of time to avoid tendon ruptures will follow the injection. At EPFAA we would have suggested EPAT (Extracorporeal Pulse Activation Technology) for his injury to alleviate his Achilles tendon pain. EPAT is a new technology introduced to the Lehigh Valley by Dr. Adam Teichman. EPAT, is a painless treatment used to treat chronic pain such as Achilles tendonitis. The mode of action during Pulse Therapy is to stimulate the chemical process providing improved blood circulation in the pain regions to promote natural healing without restriction of any activity. • Patients are immediately fully weight-bearing without restriction of activity. • Over 80% successful outcomes [Published Data–Long-term pain relief (Results retained)]. • Non-invasive so bio-mechanics are not affected–future treatment options are not limited. To learn more, visit our website. If you are interested in the EPAT program, schedule an appointment. Here at East Penn Foot & Ankle Associates, we are committed to your health. I want to let you know about a state-of-the-art, painless procedure that we offer at East Penn Foot and Ankle Associates to treat heel pain. It is called Extracorporeal Shock Wave Therapy, or ESWT. With the new treatments we offer, like ESWT, there is simply no reason for you to suffer from unnecessary heel pain any longer. There Are New Procedures That Can Help! Extracorporeal Shock Wave Therapy, or ESWT, is a state-of-the-art option for people who suffer from chronic heel pain. It is a non-invasive procedure using high energy sound waves that takes no longer than 20 minutes and shows results very quickly. The basic idea behind ESWT is very simple. The foot is placed on a machine which sends about 3,600 sound shock waves to the area where the plantar fascia (the connective tissue) is inflamed and hurting. These waves are able to break down and get rid of bad tissue and allow healthy tissue to take its place. It helps bring new blood vessels to the area, and then breaks up the scar tissue which essentially creates a healing process. Heel Pain Doesn’t Have to Slow You Down. Shock wave therapy does not hinder your everyday activities. You will still be able to go on like before without the use of crutches or a cast. There is no down time required; the only thing that is required, in fact, is stretching exercises which we will give you to do. 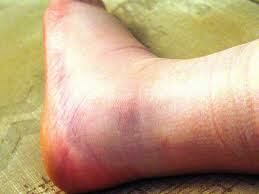 Over the span of about 2 to 3 months your heel will continue to heal. Most patients will see results almost immediately and by the end of the 3 months will have no pain left. Please make your very next step on your 75,000 mile journey a visit to our office so that we can discuss your heel pain symptoms and find the right treatment for you. When you are suffering from heel pain you are suffering needlessly. If you or someone you love is experiencing any pain or discomfort in your heels, please give us a call at 610-432-9593 and make an appointment to come in to see us. We will take the time to listen to you, understand your concerns, and then offer the best treatment options. P.S. You can call our office at 610-432-9593 to schedule an appointment. We are located at 2895 Hamilton Blvd., Suite 101 in Allentown. You can also visit our website at www.EastPennFoot.com. P.P.S. If you know someone else in our area who would benefit from their own copy of my free book Heel Pain 101, please have them call 888-482-9604 or visit our website to request their own personal copy. Here is the staff from the PA Foot & Ankle Associates Allentown, PA location. We appreciate all of their dedicated work! When should you visit a podiatrist? Going to the podiatrist is not just for elderly people. Like other doctors, it’s a good idea to visit early to establish a baseline so you can compare changes in your feet from year to year. At PA Foot and Ankle Associates we are not just here for you when you have a problem with your foot or ankle. Having a starting point is a great way to mark the changes in your feet. Three-quarters of Americans will experience some sort of foot or ankle problem in their lifetimes, so starting examinations early is the key to prevention. Contact PA Foot And Ankle Associates to make your appointment for a complete foot and ankle wellness exam today.